Welcome to the Tempera Quartet's website! 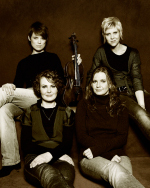 Check out our concerts, recordings etc. - hope to see you at some of the exciting venues we will be playing at in the coming months!